Fires, Floods, and Our New Gelatinous Overlords. Knock on Effects of Climate Change Ramp up. The Nuclear plants threatened by midwest flooding, exactly the kind of flooding scientists have warned that rapid climate change would bring, are safe for now, we are told. 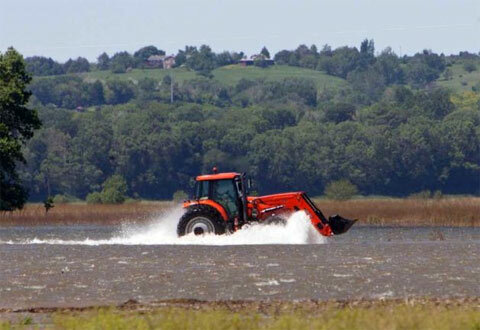 But the threat will last for months, as huge volumes of water from heavy rains and winter snows make their way down the Missouri river. Flooding is just one of the rapidly fulminating series of climate change knock-on effects, that will be steadily ratcheting up the pressure on governments, economies, and those populations most vulnerable, the poor, especially in the third world. While unlimited resources, and the highest of high tech remedies can be brought to bear in Los Alamos to protect sensitive stockpiles of radioactive materials from raging wildfires (another climate pumped wild card) – policy makers need to imagine the effects of proliferating nuclear materials, and the effects of future events on nuclear facilities in places like Pakistan, Iran, Syria, Yemen, Libya, or any of the other underdeveloped areas where the industry is ramping up to supply power facilities. In climate change, nature holds the cards. And this summer’s events point to a deck stacked with unexpected jokers. The National Oceanographic and Atmospheric Agency (NOAA) will release new US temperature data on friday showing that the 30 year “normal” has moved upward a notch. “The climate of the 2000s is about 1.5 degree Fahrenheit warmer than the 1970s, so we would expect the updated 30-year normals to be warmer,” said Thomas R. Karl, director of the National Oceanic and Atmospheric Administration‘s National Climatic Data Center. That recent temperature trend was enough to drag the three-decade moving average, from 1981 to 2010, up by half a degree Fahrenheit from the 1971 to 2000 period, according to the report by NOAA. 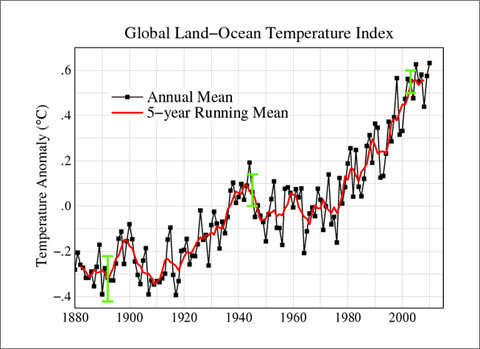 The 30-year baseline is used by scientists to understand climate conditions and trends, including climate change. Besides providing a perspective for daily weather records, the data are widely used by utilities to project energy use, by farmers to make decisions on crop selection and planting times, and by others whose livelihoods are dependent on weather. Jim Hurrell, a senior scientist at the National Center for Atmospheric Research, said the rise in temperature was attributable to a buildup in greenhouse gases. “The climate is indeed warming and this is evidence for it,” Hurrell said. PETM, the Paleocene – Eocene Thermal Maximum. That’s the last time in earth history that things changed in a way similar to the way they are changing now. It was 55 million years ago, give or take a millenium. Scientific American (sub required – you can also buy single issues) has an article by one of the real experts, Lee Kump, comparing the pace at which the earth changed during the most recent Great Warming event. 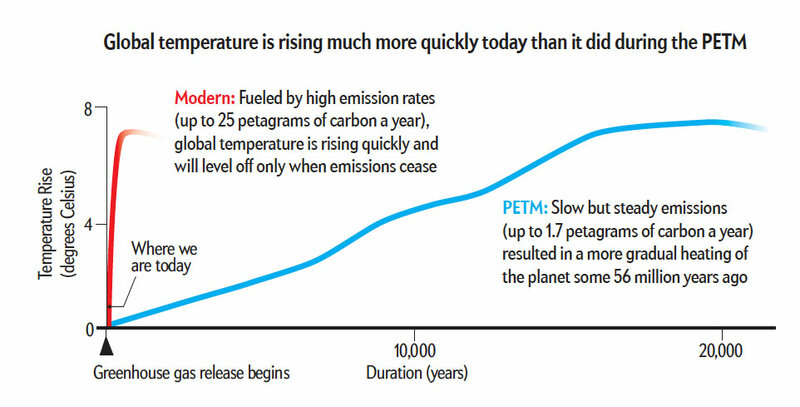 As the sobering graph shows, the current CO2 buildup is prodeeding at a blistering pace compared to the ancient past. Current rates of change are thousands of times faster than normal, and even 10 times faster than one of the most spectacular geological changes in the record. what our persistent burning of fossil fuels could deliver in coming centuries….. New answers provide sobering clarity. They suggest the consequences of the planet’s last great global warming paled in comparison to what lies ahead, and they add new support for predictions that humanity will suffer if our course remains unaltered. The Center for Climate Communication at George Mason University has update its “6 Americas of Climate Change” study, a breakdown of where we are in raising awareness on climate issues. The study affirms that the majority of Americans are concerned about climate, and favor the measures needed to address it, confirms my observation that the people who know least about it are most sure they are “well informed”, notes that the majority still trust scientists in government agencies to tell them the truth, and gives a roadmap for how and who to target in communicating the science of climate change. The proportion of the population in each of the Six Americas has remained relatively stable over the past year, with 39 percent of Americans in the two groups most concerned about climate change – the Alarmed and the Concerned – and a quarter of the population in the two groups least concerned about the issue – the Dismissive and Doubtful. The high level of concern found in the fall of 2008, on the eve of the recession and prior to the release of stolen emails (known as climategate), remains an unmatched benchmark for engagement with the issue of climate change. Uncertainty on the issue remains high: More than a third of Americans agreed that they could easily change their minds about global warming – especially those in the Disengaged (73%) and Cautious (58%) segments. While 70 percent of the Dismissive said they do not need any more information to form a firm opinion on the issue, majorities of all other groups said they need at least a little more information before making up their minds, including 91 percent of the Concerned, 89 percent of the Cautious, and 86 percent of the Disengaged. Close to half of the Disengaged (47%) said they need a lot more information to form a firm opinion. Interview on WBAI monday night. AP video from June 27. FORT CALHOUN, Neb., June 28 (UPI) — The Fort Calhoun, Neb., Nuclear Station, marooned by the flooding Missouri River, poses no immediate threat to the public, the top U.S. nuclear regulator said. “The risk is really very low at this point that anything could go wrong,” Gregory Jaczko, chairman of the Nuclear Regulatory Commission, said in Omaha Monday after touring the idled facility. Jaczko toured the station 19 miles north of Omaha to see the flooding at the nation’s smallest nuclear power plant, the Omaha World-Herald reported. The river was more than 2 feet up around the building with months of flood conditions remaining. “It’s certainly clear that this is not an issue that’s going to go away anytime soon,” Jaczko said. The Omaha Public Power District plant went offline more than 11 weeks ago for a scheduled refueling outage. The plant will remain idle indefinitely, district officials said. So begins a three part series in Scientific American. Despite the protestations of the climate denial choir, the meaning of this years extreme events are becoming clear to the scientific community. “..are the floods and spate of other recent extreme events also examples of predictions turned into cold, hard reality? That’s a profound change—the difference between predicting something and actually seeing it happen. The reason is simple: The signal of climate change is emerging from the “noise”—the huge amount of natural variability in weather.